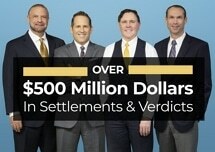 The partners in our law firm, M. David Shapiro, David Goldman, Michael Babboni and Bernard F. Walsh, along with our three associate attorneys and of-counsel attorney, have more than 100 years of combined experience. Over the courses of their careers, they have helped more than 10,000 clients pursue and secure compensation, and they can help you as well. Whether you fell on dangerous property, suffered an attack from a vicious animal or sustained injuries in an auto accident, our attorneys at Shapiro, Goldman, Babboni & Walsh will work diligently to help you secure full and fair compensation for your injuries. If you lost a loved one due to negligence, we will work to ensure the stability of your family's future. You can learn more about how we can help you by scheduling a free initial consultation at our Punta Gorda law office.